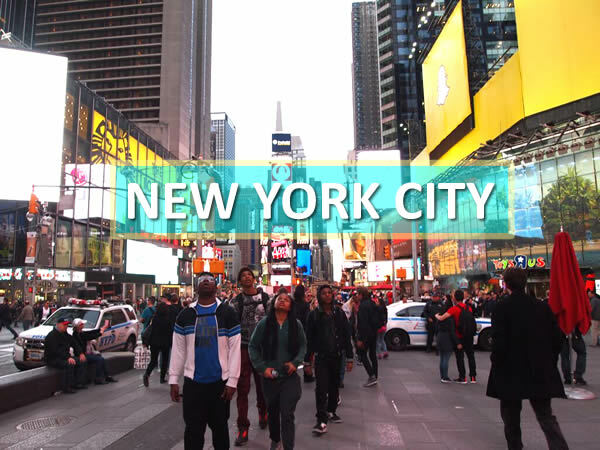 There are countless things to do in New York City may it be a food adventure, shopping, bar/club hopping, visiting museums, on a budget exploring mood, or simply having a lazy stroll in the city. New York didn’t disappoint my expectations and I’m overwhelmed by simply existing in the midst of wonderful chaos happening around me being in the city. Let’s not bore you with my stories and let’s enjoy New York’s photos! Wild. Fun. Bright. Sounds like a promising future. It’s bright flickering lights are promising, it spark creative juices in my brain go crazy. I. LOVE. IT. Ellis Island is a symbolic place for the country’s immigration, the immigrants passed through Port of New York in pursuit of the ‘American Dream’ in the past when flying isn’t a thing yet. Nearly a century has passed and I’ve finally get to be part of this history. Also, keep in mind that Ground Zero, Wallstreet, and Federal Hall (where Former President George Washington was inaugurated in 1789) is in the area if you wish to visit more significant places. Honestly, this is the most liberating place in the city (other than shopping). I love the skating rink in the middle of the buildings and all I can think of is that this is an awesome place to hang out. You can work hard and play afterwards, maybe a little cheesy for New Yorkers but you’d find me here if I live here. I can skip captioning this but I won’t, the terminal is really beautiful to do that. It’s preserved vintage appeal keeps my breath away that I soon I stepped out of the train and went to the center where the clock booth is. I can’t help myself but to keep turning, indulging my eyes and imagination to every movies and videos I’ve seen about it. Reminds me of Spain’s ‘Sagrada Familia’ and Italy’s ‘Duomo di Milano’, a Gothic architecture and well crafted edifice can’t make me stop admiring the artists who made this. The time and effort to build it artistically. Unfortunately during my visit, the interiors were being renovated. The geek hub of the city, New York City Public Library is another time traveling place that pulls you back in time you’ve never been. Paintings on the walls and ceiling makes an outrageously classical feel that is so calming. Some really old rooms that are stunning were ‘no camera’ areas but stuck in my head. All those small old school catalog drawers (the old school Google to find the book you need), the classy gold and green reading lights, glamorous chandeliers, dark wooden tables and chairs that are well kept shiny, old books stacked on levels and levels that can be accessible with an old school metal ladder that slides sideways along the wooden balcony. Hah! I can go on and on and on… You just have to visit. I could spend a whole day here! All the cool techie games and history of the techie gadgets are displayed as an exhibit. Play around it, with it, be in it. I love it! I didn’t have much time when I did, I was waiting for a friend and thought I’d drop by to check it out. I’m going back there when I’m back. Brooklyn Bridge is also across Manhattan Bridge which you can cover on your photos from taking it on either one. Brooklyn Bridge is more dramatic with all the bricks that its made of, be careful walking along the left side of the path, it is the bike lane. You don’t want to piss off a cycling New Yorker (don’t say you’re not warned). FYI, this is one subway station away from Ellis Island. It is very touching to visit Ground Zero, the former Twin Towers that has once stood there. It is now, Ground Zero and is built with man made waterfalls surrounded by a wall with names of those who died in the attack. People in the buildings and rescuers responded that died there are commemorated on the engraved walls of Ground Zero. Beside it, is the new tower called, The One tower. There are a lot of museums in New York if history is your thing. There’s the National Museum, Museum of Modern Art, Metropolitan Museum of Art, Ellis Island Museum, and a lot more.. You can find the complete list of museums in NYC here. Like Bryant Park and Central Park in New York, the city’s popular hang out place for a lazy day, running areas, play ground for New Yorkers. All the laid back fun, fitness, or even recharging your creative juices, these parks are always a cool place to be.